What does it take to earn more money and help more people as a guitar teacher? Let go of any skepticism you may feel about your potential to succeed as a guitar teacher. When you are skeptical, you hold yourself back from big success. You also hold your guitar students back from making the progress they deserve to make with you. How much experience you have (or don't have). Whether you have a music degree (or not). You don’t need any of those things. You need the right skillset and the right attitude about teaching guitar. This article helps you develop both. Help them become awesome guitar players quickly. Solve their musical problems, frustrations and challenges. Make the learning process simple and fun, so your students feel great every time they play guitar. When you do these 3 things really well, attracting new guitar students becomes very easy. As your reputation spreads, new students begin to come to you and happily pay you higher than average rate for superior results. Tip: It’s better for you to be the more expensive guitar teacher in your area who is known to be the best than to be average (or below average) and sell cheap guitar lessons. Note: You can learn to be a great teacher before becoming a master musician yourself. Yes, not all understand this, but it’s true. You develop both skills simultaneously. Improving your guitar teaching skills will make you a better musician yourself! You can start teaching guitar (and learn to teach well) even if you are not yet a highly advanced guitar player. Most guitar teachers earn between $20,000-$45,000 annually, work 40-60 hours per week and are happy to get just 20 new guitar students per year. Fact is, you could be earning 6-figures ($100,000+) per year, teaching guitar part-time. This is what the most successful guitar teachers earn. Best of all, it’s really not as hard as you probably think and you definitely can do it too, even if you’ve struggled to fill your schedule with students in the past. Want proof? Download this free eGuide to learn how simple it really is to get a lot of new guitar students to take lessons from you. Learn how to improve your guitar teaching skills fast with these tips. You begin to take your guitar teaching career a lot more seriously. You begin looking for ways to make your students better very quickly and build your reputation as the #1 guitar teacher in your area. You will likely seek out expert coaching for yourself to learn how to build your business and make your goal become reality. You become a lot more likely to actually achieve your goal. Fear of failure: you may fear that you won’t be able to attract a lot of students and make money as a guitar teacher. Fear of success: Sounds crazy, right? But it’s true… some people actually fear becoming successful and earning a lot of money. You may be afraid of how others will perceive you when you become wealthy and successful. Here is how you know if this fear applies to you: do you (or those close to you) believe that money is the “root of all evil” or that rich people are bad? If so, this fear likely applies to you in some way. Fear of marketing yourself: you may be afraid of marketing yourself if you are unsure of your guitar teaching skills. You may feel that you are not worthy of promoting yourself and taking your students’ money for lessons. Fear of looking bad in front of your students: you may be afraid of having a student ask you a question you don’t now the answer to. Solution #1: Continue to improve your guitar teaching skills. Become the absolute best guitar teacher you can possibly be. 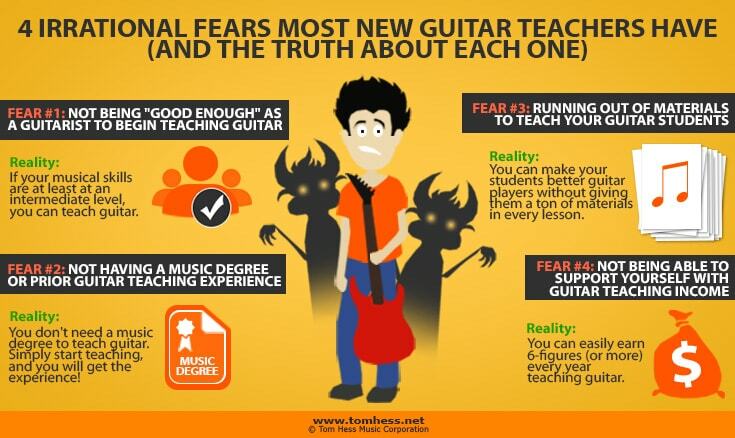 Your guitar teaching skills must be greater than any fear you may have. When you have confidence in your skills as a guitar teacher, you stop fearing failure or looking bad in front of your students. Read this article to learn how to improve your guitar teaching skills quickly and easily. Solution #2: Be around like-minded people who have an empowering outlook about money and success. This helps you overcome your fears and become more successful faster. To help your students become great players you must do a lot more than simply teach guitar. You must also mentor, coach and train your students to master what you are teaching them. This makes your students great guitar players quickly and builds your reputation as the best guitar teacher in your area. Don’t worry, it’s not hard to become an expert mentor, trainer and coach for your students. You don’t have to turn all your students into highly advanced guitarists (since most students won’t have such goals). However, you must expect all your students to reach their goals (whatever they might be). Do not accept slow progress or mediocre results. If your students aren’t practicing, find out why. If your students aren’t getting results or aren't feeling motivated to play guitar, find out why. It’s your responsibility to enable your students to make the fastest progress possible… and help them enjoy that process. Tell your students that you care about their progress, you believe in their potential and you want to see them live up to it. Your students need to see, hear and believe that you care about them. Tell your students that you expect them to succeed and reach their goals. Make sure that the goals your students set for themselves are inspiring for them. Help your students set goals that they truly want to achieve (vs. something they simply think is possible for them to achieve). If you continue teaching students who don’t do what you tell them to do, don’t practice and don’t show interest in making progress, everyone loses. You lose because your reputation suffers. Your current students lose because they are wasting their time and money on lessons. You also don’t get to help other, more serious guitar students in your area who would make great students for you. 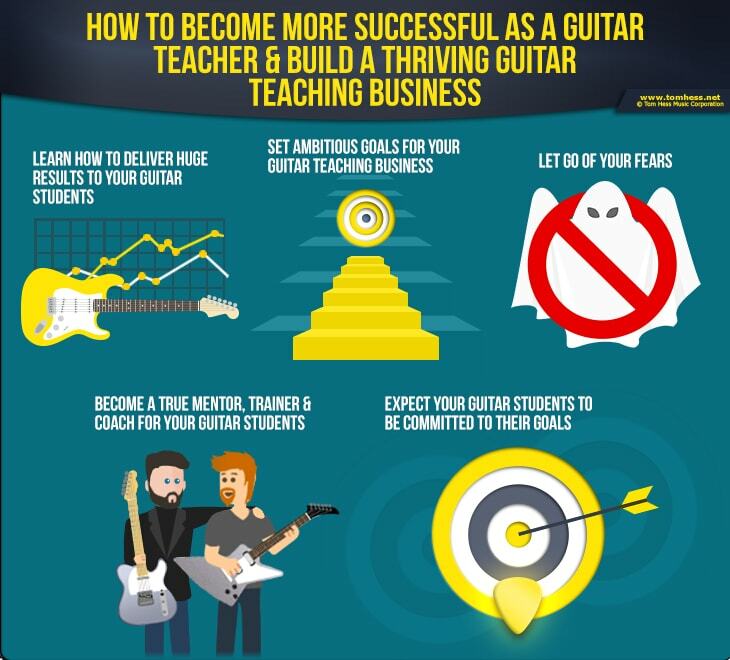 You now know what to focus on to build a successful guitar teaching business. Your next step to making a lot of money teaching guitar is to learn how to attract a lot of new guitar students quickly and easily. Download this free guitar teaching guide to learn how to fill your schedule with a lot of new students, increase your guitar teaching income and build an unbelievably amazing life for yourself. Get the training required to become a highly successful guitar teacher.